More thanÂ 99 percent of the roughly 1,000 propertiesÂ tested so far by the state and Los Angeles County around the former Exide battery recycling plant have lead levels high enough to require cleanup, according to state and local figures. Of the 626 properties tested by the California Department of Toxic Substances Control, only five do not require remediation. Of 382 properties for which L.A. County has test results, every one needs lead removed from its yard, according to the county Department of Public Health. Toxic Substances Control – with help from L.A. County – plans to eventually test around 10,000 properties in a 1.7 mile radius around the former facility in Vernon. Twenty percent of the contaminated yards have tested at 1,000 parts per million or higher â€” 180 of those tested by Toxic Substances Control, and 28 of those examined by L.A. County. Except for the five that tested clean, the rest fall between 80 and 999 parts per million. Toxic Substances Control has not provided a breakdown of how many of the properties it tested are in the second tier – between 400 and 999 parts per million – and the third tier – between 80 and 399 parts per million. L.A. County Public Health says 139 of the yards it tested registered between 400 and 999 parts per million, and 215 tested between 80 and 399 parts per million. Local environmental activists say families in Boyle Heights, Maywood, Commerce and East Los Angeles who are in the lower level cleanup tiers should not have to wait until all of the Priority 1 properties are cleaned before getting the lead removed from their yards. In the meantime, health officials areÂ advising familiesÂ not to let their kids play on bare soil, to take their shoes off before entering the house and to frequently wash hands and toys. At this time of year, that could put a damper on Easter egg hunts. In the wake of criticism that the cleanup wasÂ moving too slowly, Brown last month sought to dramatically increase funding for the effort when heÂ asked the legislature to loan $177 million dollarsÂ for the project. The funds have not yet been approved. The state would eventually seek reimbursement from Exide, although the company has indicated that it may not accept a government conclusion that it was the source of all of the lead. Lujan and others say thatÂ what the governor has requested is not nearly enough. If crews keep finding lead at the current rates, the final price tag could rise above $400 million, based on the state’s figures for testing and cleanup. Toxic Substances Control says testing each yard costs about $2,000, and cleanup runs between $40,000 and $50,000, depending on yard size and other factors. Nearly every single home examined by state and county officials for lead contamination from the now shuttered Exide battery recycling plant in Vernon has yielded lead levels high enough to demand environmental cleanup, reportsÂ KPCC this morning. 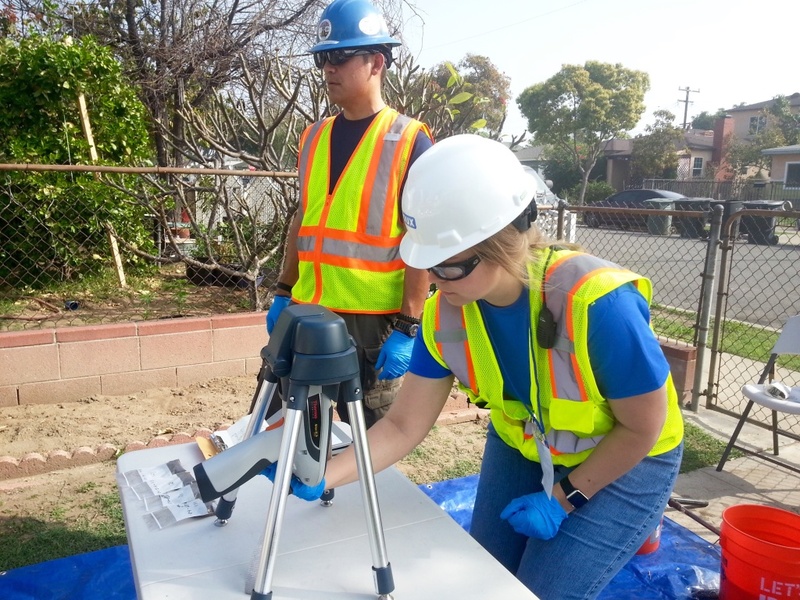 So far, more than 99 percent of the approximately 1,000 tested properties require lead cleanup, including 621 tested by the California Department of Toxic Substances Control, and 382 tested by the L.A. County department of public health. So far, only five tested properties do not require cleanup. More than 10,000 properties, including schools and parks surrounding the old Exide facility, will be tested for lead toxicity and cleaned up as needed. A couple of weeks ago, Governor Jerry BrownÂ pledged $176 million to pay for the cleanupprocess, following an outcry from activists and citizens that the residents of Boyle Heights, Vernon, Huntington Park and other surrounding communities wereÂ being ignored. AnÂ editorial in the L.A. TimesÂ argued, as did many inÂ affected communities throughout East and South East L.A. County, that the Exide toxicity was just as criticalâ€”if not more soâ€”than the simultaneously occurring Porter Ranch Gas leak. However, because the toxins were in a poor community of color, the state was less motivated to act. The cleanup entire process is expected to take more than two years, with health officials estimating that cleanup will be completed in June of 2018. Do not let kids play on bare soil, when possible. Take off shoes before coming into your home. Wet mop floors instead of dry sweeping. Wipe windowsills and other surfaces where dust collects with a wet cloth. The Exide battery recycling plant was forced to close down in March of 2015 because investigators discovered the plant had been coating surrounding neighborhoods with a fine, toxic lead dust for decades. Exide agreed to cover the cost of the cleanup.